The first big trophy of the season is coming to Madrid, after a very solid performance from the Merengues last night, where they've beaten Sevilla by 2-0. The man of the match was once again Cristiano Ronaldo, who showcased all his class by scoring the only two goals in this UEFA Super Cup final. 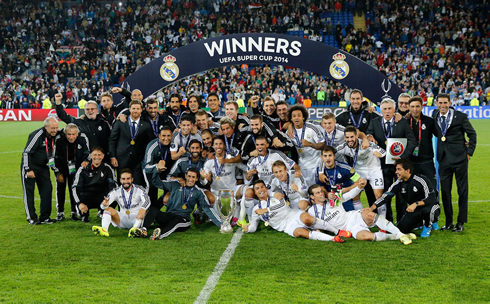 Real Madrid and Sevilla clashed in Cardiff this Tuesday night, with both teams fighting with all their weapons in order to take home the UEFA Super Cup trophy. The men in white were the ones showing their superiority within the 90 minutes of regular time though and defeated the Europa League title-holders with a clear 2-0 win. Cristiano Ronaldo played the whole game and was as decisive as he has been in the past, despite the many concerns about his true physical condition. The Portuguese forward scored the 2 goals of the final, first through a sliding finish when we were still inside the first half of an hour of the game and then, a few minutes after the second half had resumed, through a strong but accurate left-foot strike. With tonight's victory, Real Madrid won the first of 6 possible trophies they'll be competing for during the course of the current season. Carlo Ancelotti's starting eleven against Sevilla ended up being in line with what several newspapers had already predicted a few days ahead of last night's final. The highly-experienced Italian manager played with Casillas in goal and a defensive back four similar to the one that has been used in many different occasions last year. Fábio Coentrão took the left sideline, Carvajal was deployed on the right, while Sergio Ramos and Pepe were assigned with the usual tasks in the center of the defense. Unsurprisingly, it would be Real Madrid's midfield clearly suffering the most changes. Instead of playing with only one man in front of the defensive line, Ancelotti decided to pair up Luka Modric and Toni Kroos in a double pivot role that couldn't have worked any better than it did. With Xabi Alonso suspended and both Di María and Sami Khedira having one foot outside the club, Ancelotti granted James Rodríguez his first opportunity to start with the Merengues jersey. The Colombian playmaker has naturally struggled a bit to get involved in the game, but he still managed to deliver a good performance if we have in mind this was his debut for the club. As for the attack, nothing new in the European champions. 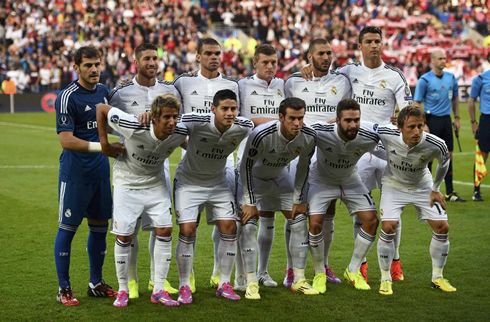 Real Madrid lined up with their famous BBC attacking trio, formed by Bale, Benzema and Cristiano Ronaldo. The three men looked even more sharp and determined than in most games of last season, all of them already displaying an impressive pace for such an early stage of the current campaign. The opener came around the 30th minute of the first half, in a typical counter-attack masterclass delivered by the men in white. It all started in a ball that Cristiano Ronaldo himself picked up still before the midfield line and which he promptly sent across the field towards James Rodríguez, through a strong low pass. The Colombian left it over to Gareth Bale on the left and after advancing a few meters close to the sideline, the former Tottenham winger crossed it over to the far post, where Cristiano Ronaldo had just arrived for it. The former Manchester United player had to slide to meet the Welsh's long pass, but he didn't miss his scoring chance from such a close distance and easily sent Real Madrid to the lead. As time passed in the game, the Merengues kept controlling and dominating most of it, leaving Sevilla no other choice but to continue fighting in order to at least maintain their hopes of winning the UEFA Super Cup alive. However, Real Madrid managed to reach their second goal shortly after the second-half was resumed and it would be Cristiano Ronaldo punishing Sevilla once again. The 2013 FIFA Ballon d'Or winner completed his double in the 50th minute of the game, this time after beating Beto with a great left-foot strike that proved to be be too strong for the goalkeeper to handle from that distance. It was definitely a great start for both Real Madrid and Cristiano Ronaldo, who can now start focusing in their next challenge that is scheduled for next week, the Spanish Super Cup. The Merengues will face Atletico Madrid in a 2-leg final, with the first of those two games being played in the Santiago Bernabéu, on August 19. The return leg in the Vicente Calderón will take place on August 22, just a few days before the Spanish League kicks off. Cristiano Ronaldo next game for Real Madrid will be against Fiorentina, in another pre-season fixture to prepare the upcoming challenges and it's scheduled for August 16. You can watch Juventus live stream, Real Madrid vs Fiorentina, Barcelona vs León, Manchester United vs Swansea City, and Borussia Dortmund vs Bayern Munich, all matches provided from our live football streaming pages.